Well before our ancestors, some 45 million years ago the forest lived and reproduced. Along with creating more of themselves, they produced a natural substance called Resin. Resin is a natural byproduct that allows trees to close off their wounds from Insects and other calamities such as branches that break or bark that falls off. The resin is sort of the bodys immune system; it locates the problem area and seals it off from further damage. As trees shed their protective substance, it drips and flows down the tree from its wounded areas. Along the journey, the Resin collects other organisms such as insects or plants which become encased in the Resin and ultimately are preserved better than any historian ever dreamed. And most scientists salivate over. 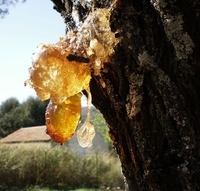 Today, there are only two types of living trees that can produce such resin that could stand the test of time and potentially, produce Amber again. Whats really interesting is how Resin turns into the sophisticated Amber product that jewelers covet. Not so surprising, its called amberization. As the Resin leaves the tree, it becomes more firm. Within the Resin you will find other interesting substances such as alcohol, Amber Acid, and oil. You will also find aromatic compounds that have been around since the beginning of time such as myrrh and frankincense. As the molecules begin to join forces with each other becoming larger, they also undergo change. The product that is the hardened Resin is called Copal. This product remains in the soil and becomes part of it long after the trees have died. As the molecules inside the copal grow in size, all the volatile oils disappear and that is when copal becomes Amber. Depending on the type of soil or sediment the resin is deposited in, this process can take anywhere from two million and up to 10 million years to become Amber. As a result, samples of natural Amber are the window into the past, as far back as 280 million years, for many insectologists and tree scientists who have determined that the first Amber bearing insects actually appeared 145 million years ago. The discovery and fascination with Ancient Amber in the form of jewelry dates back about 10,000 years! With variations in Color And Transparency, Amber is ideal for jewelry. Amber can be found in yellow, golden yellow, orange, red, blue, green and black. The density of amber can be compared to the human fingernail and its surface can be scratched. Its always warm to the touch, part of its invaluable Healing Properties, and often contains water or air bubbles or water in air bubbles. Amber is highly prized by collectors and scientists alike especially if an Insect is trapped within. Because of the value of Amber, it is also has knock-off versions which are fake. We know that imitation Amber comes from copal, glass, phenolic resin, celluloid, casein (cheese) and modern plastics. More often than not, insects are introduced into the mixture to fake authenticity. One way to determine if the amber inclusions are fake is to look at their size. If theyre any longer than a millimeter  tops two millimeters, theyre fake. Whats more, if the inclusion looks more like a fly than an extinct insect, you can be certain its not worth looking at at all. sort of like pine trees, its real amber. If it smells sweet instead, its copal. the other hand the smell is sweet resinous, then its copal. (You need to be vary careful with your heat testing! Plastics are both flammable and potentially harmful if you inhale their vapors! Step 4, is the last and final test. You can place seven teaspoons of table salt into 12 inches (300 milliliters) of water and keep stirring until all the salt is dissolved. If your sample rises to the surface, you can be sure its either amber or copal. Any other materials will sink to the bottom! Amber can be carved and shaped into exquisite Amber Jewelry. Dating back to medieval times, Amber has been cherished in the form of rosaries and prized as stuff boxes and tobacco pipe stems. One of the most interesting stories about the power of possessing Amber occurred in 1701 when Frederick of Prussia commissioned an entire room to be covered in decorative Amber panels. Frederick then bestowed this room as a gift to Czar Peter the Great of Russia in 1717 and it was shipped to the Palace in St. Petersburg. In 1755 the room was moved again to Ekaterininsky Palace in Tsarskoye Selo. When the Nazis found it in 1941, the dismantled it completely and moved it to Koenigsberg castle. The exact location of the panels remains a mystery today although one panel showed up at auction in 1997. Today almost everyone is familiar with the molecule DNA (deoxyribonucleic acid) which contains the genetic blue print of life. In 1992, scientists discovered DNA from an extinct bee preserved in Amber. You will surely remember the blockbuster science fiction movie, Jurassic Park, which was based in part on this very same discovery. Although the period of Jurassic amber (146 to 208 million years ago) doesnt seem to have any insect inclusions, scientists are able to extract DNA from those pesky insects that bite and extract blood from humans. the timeless survivors of the ages, to thank for preserving a museum of the past.